Preparing for the big sunshine we will have. I want some glasses like that!!! Which day is that planned for? We really need to be optimistic. 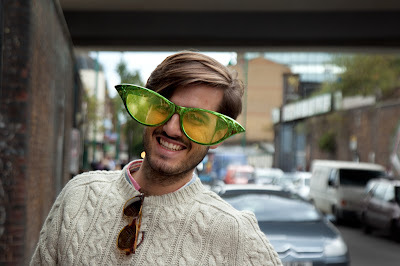 You get so much sunshine in London, I can see why these sunglasses are necessary. LOL! I needed that... thanks. Have a great day, MO. Dude - you got style! Keep smiling! That is a great smile! Very nice Mo. Too bad I can't share a little sunshine with you. We could sure use a little rain. Your photo put a smile on my face. My summer vacation has just started in rain, but I'm an optimist preparing for the big sunshine we will have. lol this guy just made me smile big!!! Such a warm sweater - hope the sun brings warmth! Are these replacing the 'rose tinted' spectacles Mo? Hope the sun comes soon. Very different from the sunglasses I bought last week. I'm a bit jealous of the Optimist now.